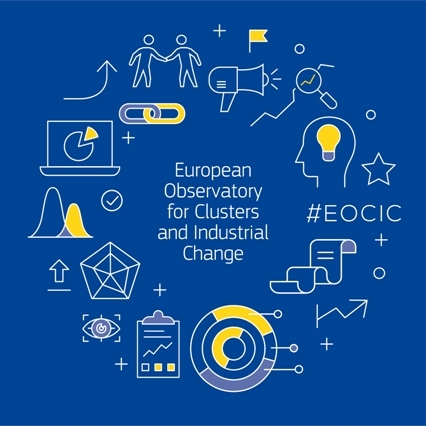 The European Observatory for Clusters and Industrial Change (#EOCIC) builds upon and brings together the work undertaken by the European Cluster Observatory and previous work of the European Service Innovation Centre, but with a stronger and wider focus on the role of industrial change. The new Observatory will not only look at service innovation but also at key enabling technologies, digitalisation, creativity and eco-innovative, resource-efficient solutions as the key drivers of industrial change. Likewise, wider indicators for industrial and entrepreneurship performance and how these are connected among each other and with cluster development will also be part of its scope. Its vision is that enterprises, particularly SMEs, are provided with more favourable regional ecosystems and better support for innovation and entrepreneurship, in general, and adjusting to industrial change and reaping growth opportunities, in particular. THE FIRST EOCIC NEWSLETTER IS OUT! Click here to discover an overview of the activities undertaken during the first year. On 22 February 2018, representatives from 25 EU country ministries met in Brussels for the First European Cluster Policy Forum, which took place during the EU Industry days (22 and 23 February 2018). During the meeting, national representatives, cluster policy experts and Commission officials talked about designing and implementing effective cluster policies by scaling up existing good practices to enhance industrial change and growth. They learned about the latest development within the different European cluster initiatives and shared good practices to promote mutual cluster policy learning. The video below provides an outlook on the interactive event and its fruitful discussions. This was the first of a series of events. The Second European Cluster Policy Forum took place on 26 April 2018, and focused on cluster labelling, mobility schemes for cluster managers and State aid issues related to cluster policy. Click here to read more about the discussions around the themes addressed. The next European Cluster Policy Forum will take place in Brussels on 15 November 2018 and will focus on the topic of entrepreneurship. THE SECOND EOCIC NEWSLETTER IS OUT! Click here to discover the latest achievements. These tasks are implemented by the Consortium headed by Deloitte Consulting and Advisory with Maastricht University MERIT, Fraunhofer ISI, Valdinini Vicari & Associati S.r.l. (VVA), Centro Studi Industria Leggera (CSIL), Technical Research Centre of Finland (VTT), Sociedade Portuguesa de Inovacao (SPI) and Strasbourg Conseil (SC).